I’ve been thinking about it for months–trying to decide whether I should have Mandi come figure out what to do with my family room, or my master bedroom. How would I plead my case? What could I bribe her with? These were the thoughts running through my head when one day, I was on the phone with my beloved little sister, Shanda, trying to channel my inner-Mandi and give her decorating advice for the rooms that are frustrating her in her mid-century rambler in Colorado. She wanted fresh, she wanted bold, she wanted modern and innovative. Then it hit me! I could not enter the Epic makeover contest, because it was my sister, Shanda–not me–that was the perfect candidate to be the recipient of Mandi’s genius, and that she–quite possibly–was destined to become Mandi’s new BFF. So in a rare (probably never to be repeated) Katniss moment, I am offering up my blog as tribute to my sis in hopes that it will save her from a life of despair in her home in it’s current state. A little too much drama with the Hunger Games analogy? Ok. I’ll tone it down a bit. But you’ve got to admit this is pretty noble of me! Here’s why I’m doing it? Duh! She’s my sister. 🙂 But she is also one of my very best friends in the whole world. Shanda had the fortune of being born 8th out of 8 children. Her way of standing out in that crowd was to be the fun one. (Yeah, none of us had gone that route, though the perfectionist and overachiever slots were all taken). She has always wanted to make everyone feel happy and loved. She is spunky and energetic, and has an enthusiasm for life that I find myself envying. She is the mother of three small children and a stepson, who are so lucky to have a mom who is so committed to them and who really “gets” kids. She is always coming up with ways to teach them things or play with them that most moms just don’t have the patience for. (I don’t.) She doesn’t have a crazy sob story, but life with young children is never easy. Her husband travels a ton for work, so she often gets to manage all of that chaos alone. Their home is not their ideal one, but in the name of financial responsibility, they have decided they will be staying put there for a while. She really wants to make the most of it and have it feel like their home. She’s game for anything! She often calls me with big crazy ideas for her house and I have to talk her through the logistical difficulties of such an attempt. She is not afraid to DIY! She painted her entire kitchen and kitchen cabinets by herself–while her husband was out of town–with out anyone helping out with the kids. (I still don’t know how she did it). She’s not afraid of Thrift! We grew up in a “make it do or do without” kind of home. Our homes have largely been furnished by Craigslist. She lives in beautiful Colorado Springs, which is an absolutely lovely place to visit! Did I mention how much fun she is?? I’m going to want to come over for a slumber/work party! There are two main rooms Shanda has been talking about making over for a while now, and they are the two main living areas in her home. They won’t look horrible in the videos, because they have already done a lot of work to make things livable, but they don’t reflect Shanda’s fun personality or her design taste that is much more modern. Specifically, mid-century modern, which is the age of her home. She would like it to look it’s age–in a fresh and fun way. I got her to make a couple of videos so you can see how cute she is and the spaces she needs help with. I know Mandi would work magic in either one of these spaces. Click play to see how delightful Shanda is and get a better view of the room! (Gee. I hope Mandi doesn’t make her get rid of the Spiderman balloon! :-)) The video helps show the long awkward basement she is working with. So this is my entry for the Epic Room Makeover contest. I hope I’ve helped you to understand how much Shanda is meant to be the winner!! 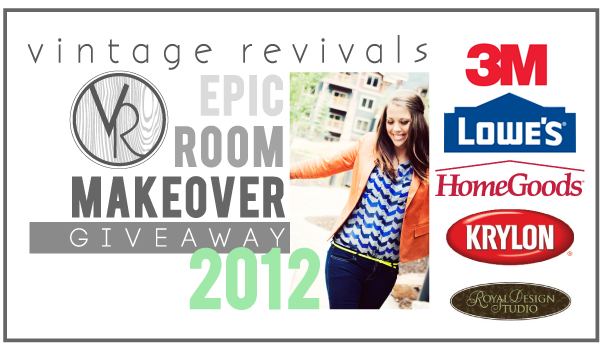 On Sept. 7, please help us out by voting for Shanda to get win the Epic Room Makeover! But don’t think I’m always this nice. Next year, Mandi is coming to Arizona!!! Kendra, you are a great sister (but we already knew that.) I LOVE this post and I hope if Shanda wins you will come and help!! Love you friend! !